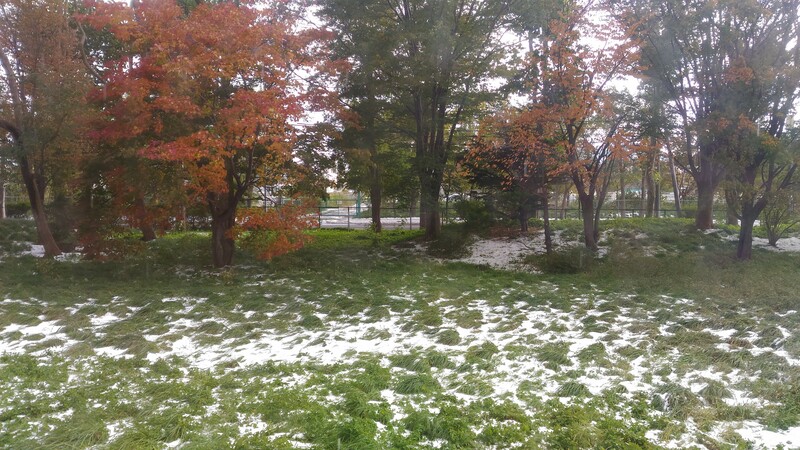 It’s October and it has already started snowing in Sapporo, Japan. Earlier there were rains due to typhoon and now Sapporo has experienced snow. It started snowing in the afternoon and it seemed like a hailstorm. The snow was perfectly cubical shaped. All the roads were snowcapped. Early morning, the roads were all clear and it started raining gradually. Nobody had a slightest hint that snow would hit Japan so early. It felt just like sugar cubes falling on the road. All of a sudden the temperature went down and everyone had to stay indoors. Check out the video below which was taken through the window. Nobody dared to go outside to click a picture or shoot a video. There was a strange thing that happened last night. It seemed as if the sun did not set in Japan last evening. There was light everywhere as if the sun was hiding somewhere behind the clouds. Snow could be seen on the grass too and it looked amazing. All this was very exciting for the new foreigners in Japan. It was a new experience and everybody wanted to watch the morning scenery. All snow softly melted except on the sidewalk. It’s still there in some deserted areas of Sapporo. Now Sapporo is looking more beautiful in this Autumn. The colorful maple trees and white snow on green grass adds a nice tapestry to this beauty. If there’s another heaven on earth, it’s in Sapporo. Keep watching this space, for more fun and news! !